This behaviour continues in the Facelift too, I agree. I had hoped they rectify this brake feel in the facelift model atleast. Worst part is feedback on the pedals/feet when braking over a pothole or over a gravel filled road. The brakes were one of the reasons for me to rule out Creta during my decision making process. It felt extremely spongy and I was not at all comfortable. I asked the SA about it and he asked me to check another car. As per him, it might be due to the test drive car having been around for some time. I wasnt convinced as I had read about this issue earlier on Tbhp anyway. - Fuel efficiency: A lot better than I expected. Have got 15.4 average on the highways yesterday. Kept varying the RPM within 2000 (that is 85-90 kmph) all the way through. Any update on the petrol AT mileage within the city in bumper to bumper traffic? The car is among the 2 final shortlist for me and am wondering if I should take the petrol or go for the diesel AT. usage isnt going to be much, but to re-sell a petrol SUV is going to be a challenge 3-4 yrs down the line. The car is among the 2 final shortlist for me and am wondering if I should take the petrol or go for the diesel AT. In my opinion, diesel makes sense only if your annual usage is more than 20k km. Both the engines in Creta are super refined, smooth and widely acclaimed here. You cannot go wrong with either. So it all comes down to the numbers. Down the line I think diesel cars will be more difficult to sell. The restrictions on diesel based engines are only going to increase and spread out of NCR. My usage is more likely to be in the 10k-12k a year range. Assuming a 4 yrs period with mileage at 8KMPL for petrol and 13 for diesel and 10% appreciation in fuel cost - the gap in fuel cost is ~2 lakhs over 4 yrs (my anticipated holding period of the car). This just about covers the on road price gap. About the resale. My feel is that with restrictions on newer diesels making them more expensive, chances are older ones will be more in demand (especially since older ones will have a timeframe of a few yrs before new rules apply). I have a feeling that the diesel will fetch me atleast 50k over the petrol AT at resale. Are maintenance costs for the diesel significantly higher than the petrol for hyundai?? Even if its a break even on either, I will prefer the diesel for the higher torque. Any update on the petrol AT mileage within the city in bumper to bumper traffic? In the city, I'm getting 8-11 based on traffic. I have just completed a 1500km round trip; Got an average of 16.5kmpl. 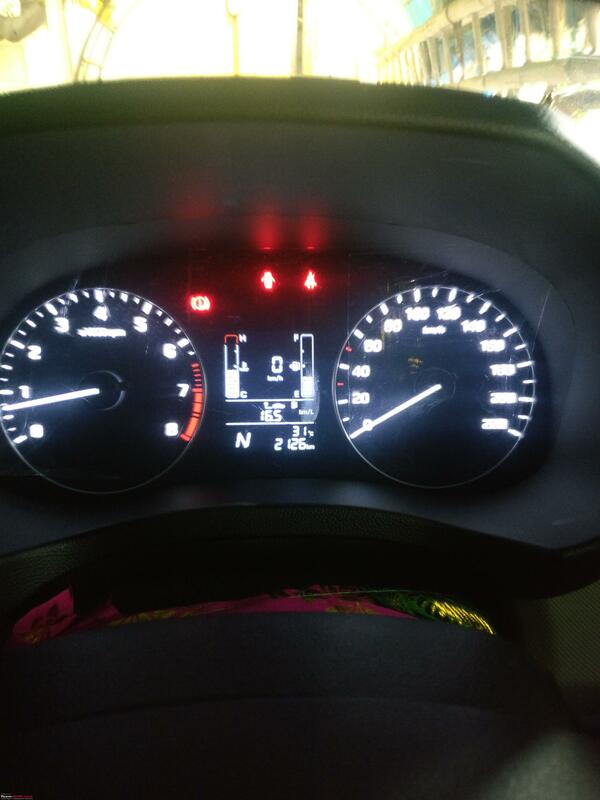 In this trip, I have also tested the mileage using tankful method. The figure was 16.48kmpl. Was very surprised with this result as I thought manufacturers bump up the MID a bit to make us feel good. Here is an image of the MID. 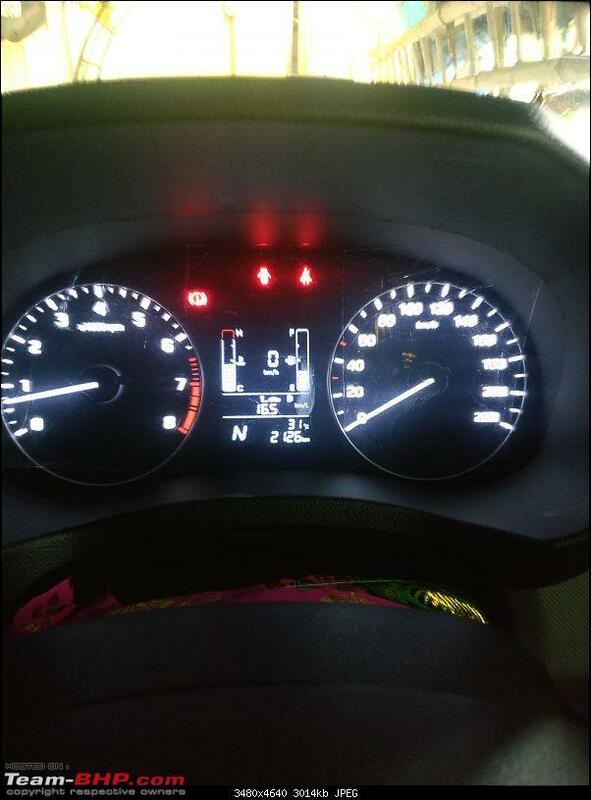 Please note that I've not crossed 100kmph (~2100 RPM). It was so tough though. Apart from these, I will be really missing those cooled seats of the Verna which is a very good thing given the humid climate we have. 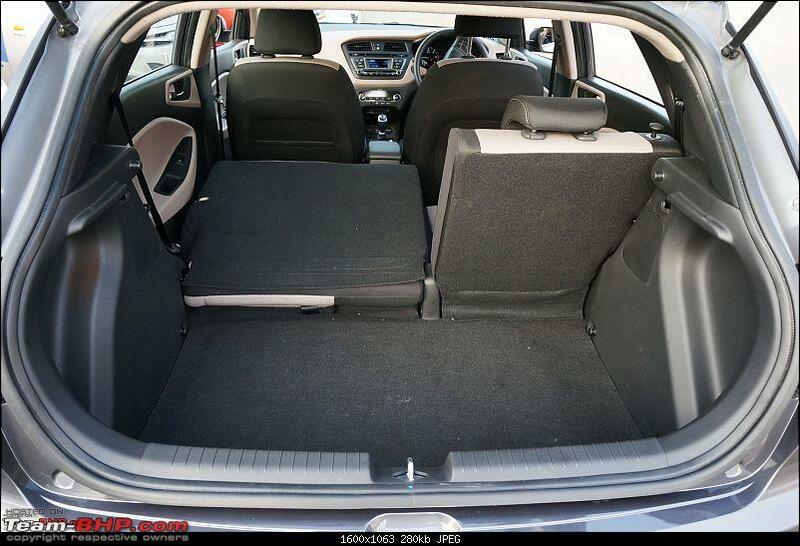 Why they ignored this in the Creta remains a wonder when they could provide this in a car which is a segment lower. Last edited by deemash : 1st August 2018 at 11:38. Last edited by aviraj : 1st August 2018 at 11:59. I presume this was the case with pre-facelift models too. I own the SX(O) that comes shod with Bridgestone Dueler HP Sport (215/60 R17). My colleague who has a SX with 16" alloy gets the Goodyear tyres. Have seen the Kumho ones but lesser in number than Goodyears. Apart from the missing features at this steep price point and compared to the features available in a longer car like Verna, that too at 1 lakh rupees less, I see one more drawback in the Creta. 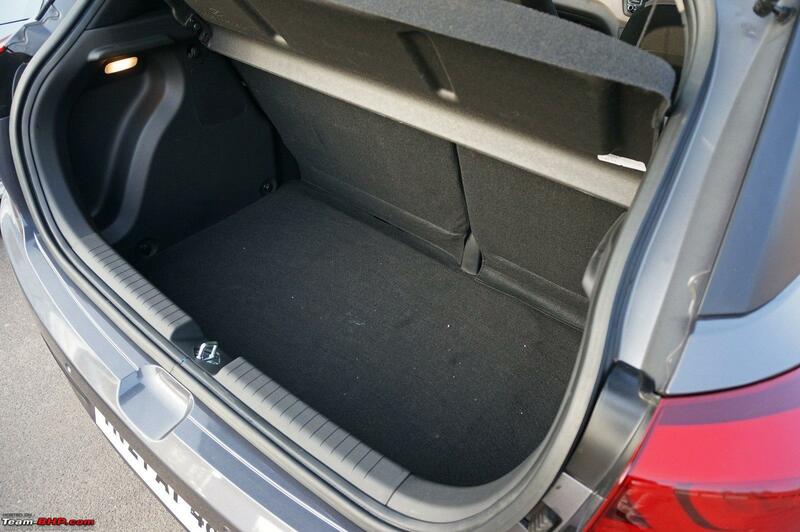 The boot space in the Creta could have been well designed to liberate more space. 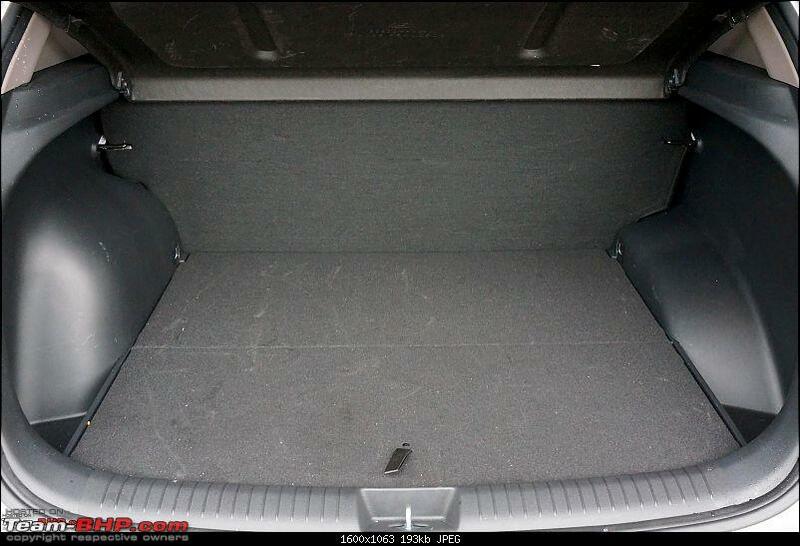 From the pictures below one can compare the depth of the boot between Elite i20 and Creta (pictures taken from the Official review threads in Team BHP). In spite of having the same orientation of the placement of the spare wheel (except with a 1-2 cm wider tyre in Creta), similar bumper height and Creata being a taller car, the depth of i20's boot is much more, whereas in the Creta, the boot floor is almost at the height of loading lip. 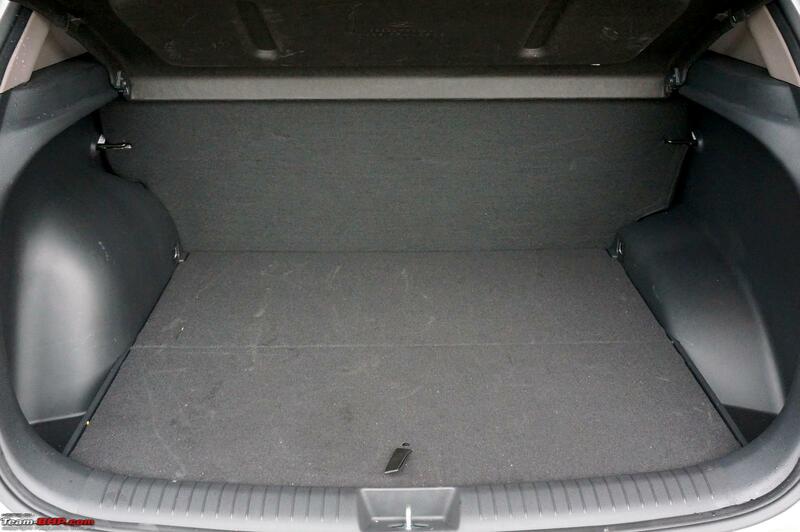 I really failed to understand where has the space under the boot floor gone. Definitely it is not due to higher ground clearance that the boot is shallow. This clearly resulted in good 30-40 liters of boot space deficit and made the spec sheet of Creta look like falling behind competition in this aspect. Hyundai also did not officially mention the cargo volume in the Creta's webpage. Yup, I have a Creta E+ with Kumho tyres. The boot space in the Creta could have been well designed to liberate more space. I think the shallow depth actually helps in easier loading and unloading of luggage from the boot. While it reduces the volume, the compromise is offset by the ease with which the luggage is handled. I think hyundai would have kept in mind that the loading lip of the creta would be much higher than the i20, if in addition, you had a greater depth of the boot, it would result in much more effort especially on heavy luggage. Adding to what BHPian RedHerring said - Almost all SUV's will have no loading lip since it makes it easier to load/unload the luggage. To experience this, try taking the spare wheel. You will immediately understand the pain . But wish it had a more squarish boot. The suspension intrusion is a bit prominent. 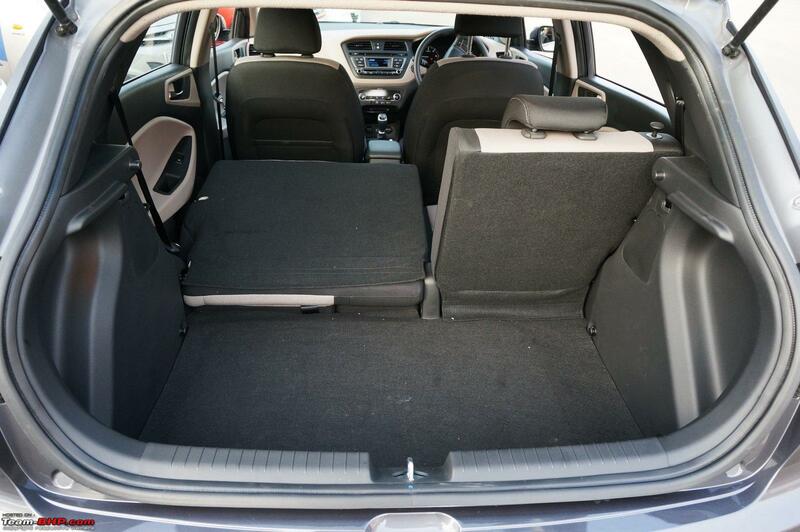 But having said that, it does swallow a lot of luggage and you get a flat floor when you fold the rear seats. Here are some of the "heavyweights" in my car. Adding to what BHPian RedHerring said - Almost all SUV's will have no loading lip since it makes it easier to load/unload the luggage. Anyway these are customer's wishlist only, some of which never manage to move to the cart. By the way is anybody aware of the reason why the GC and the boot space is not officially declared for Creta? Well, we are on the same boat! So i went ahead and checked out the E+ variant myself! I checked out the Creta E+ petrol this week. Let me share few pics for you. Chrome/ silver finish on the front grille & front fog lamps are missing. As an accessory, fog lamps from Hyundai costs around Rs 8,000 and the ? Getting my E+ 1.6 Petrol delivered this weekend. Regarding DRL/Fog Lamps, I've been quoted Rs.12,000/- for OEM Fog Lamps with DRL by Trident Hyundai in Bangalore. I guess the 8K is for Fog Lamps without DRL's. Kindly clarify! 1) Stock fog Assembly in lower variants from dealership itself ? approx costing for same ? also does company provides wiring for fogs or we need to install entire wiring harness along with fog housing? If anyone have Creta 2018 accessories list with price then please share here. My E+ 1.6 Petrol is getting registered today (16-Aug-2018) and delivery scheduled during the weekend. Dealer is Trident Hyundai, Bangalore. Unfortunately, the newer Creta's 5" infotainment does not have input for the camera unlike its pre facelift version. Since this is a hot selling cake, there are hardly any offers/discounts available at the moment. I was able to strike a deal only on Insurance. Paid about 27K instead of 52K for Zero dep Hyundai Assurance with 35% NCB from my previous car policy. All times are GMT +5.5. The time now is 18:19.